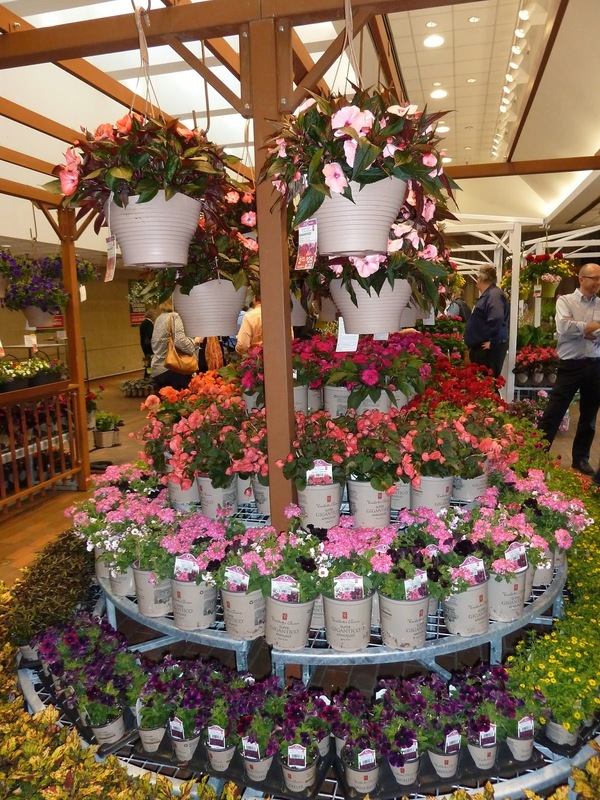 One of the highlights of my garden year, is Loblaw's Lawn and Garden Preview. 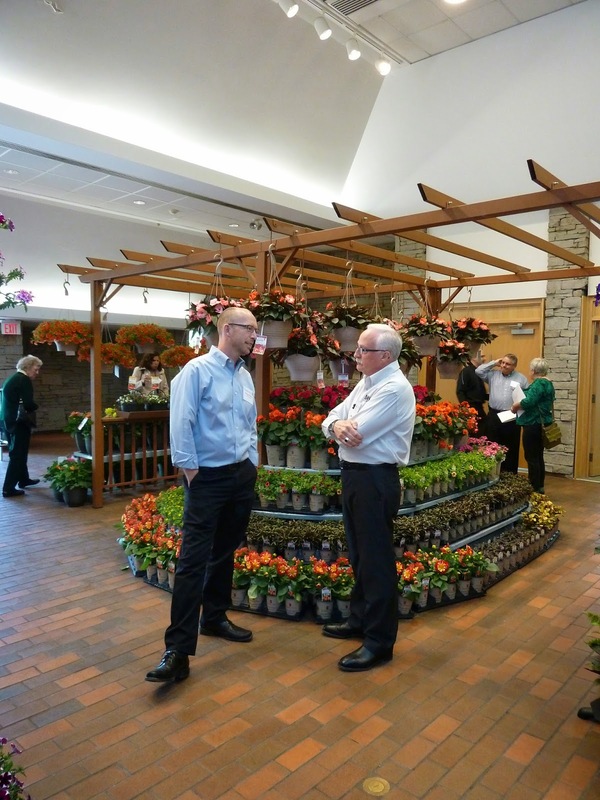 Many years ago, I worked at Loblaw as a weekend horticultural expert and had a great time helping customers find the perfect plant for the perfect spot. It satisfied two of my favourite things - plants and giving people my opinion. #1 no more Insiders Report. Instead, a pretty colourful catalogue in English and French. The photos are lovely, but I miss the snappy text that made me feel like I really was getting an inside report on something no one had ever seen before, and if I didn't rush over to the store, I was going to miss the boat. #2 an excellent tagging system. Sun, Sun/Cloud, Cloud. All colour coded and easy to read, making it much easier for the shopper. 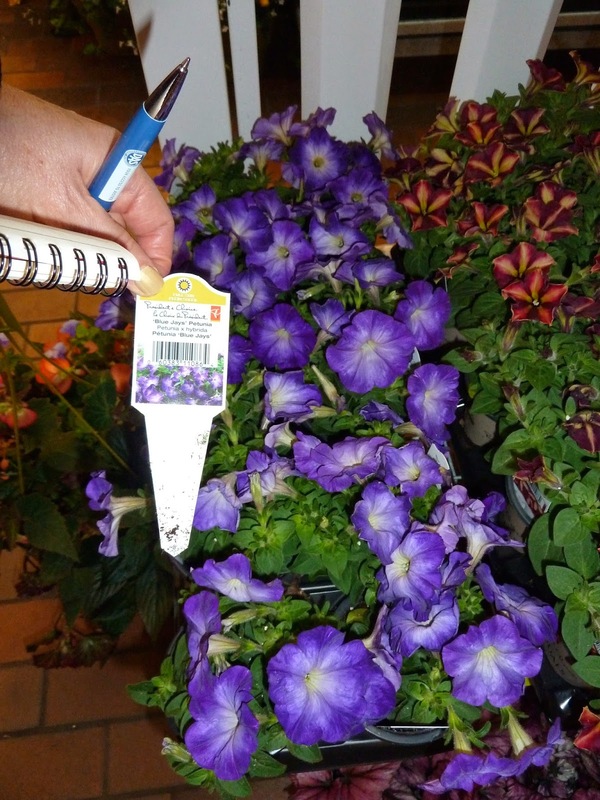 #3 lots of replacements for Impatiens that are a total no-go because of the problem with downy mildew. Which is the best one? Well, you're going to have to try to figure it out for your own situation. But, I'm guessing that if you like the carpet bed look, one of the Bada Bing series of Begonias should work best for you: 4 flower colours - 2 different leaf colours - and they do well in sun and shade and spread nicely. They also have a long period of bloom and take cold well which helps stretch the season into late fall. #4 even more tropicals. For really small gardens and for those with a time commitment equal to the length of time of filling a watering can and spilling it over a pot, you can't do any better. 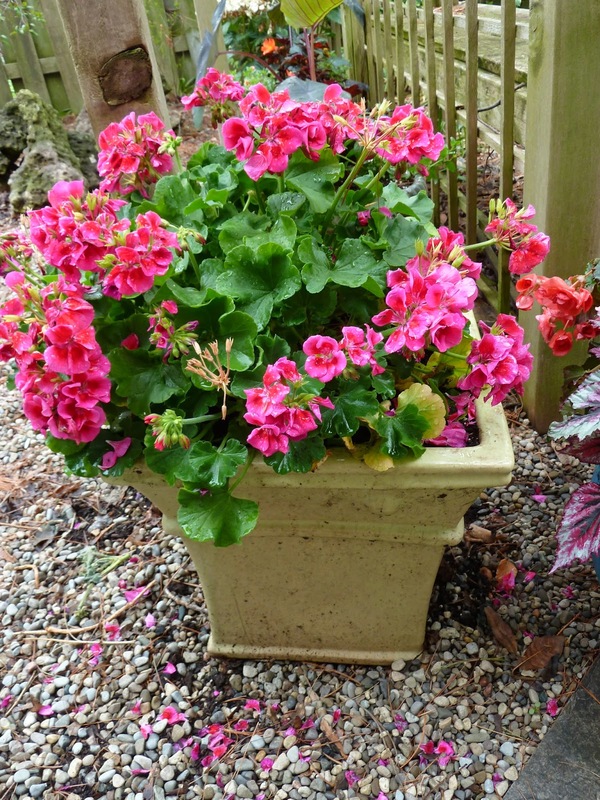 Fertilize every two weeks - pull off any dead stuff - and you have a one pot wonder. #5 Tons of new vegetables. And, again lots of herbs in pots. #6 lots of catering to those who like to do nothing but select, purchase, place and go. Many new and very beautiful pre-done baskets. This is Calibrachoa 'Aloha Hot Orange'. It's been hit hard in two big rain storms and I think still looks pretty good. In fact it looks far better than my internet, phone and cable fared - all were fried by lightning two days ago. I dismantled one of their hanging pots and planted it up in one of my own. This is exceptionally long-lasting Calliope series Crimson Flame. My mother's older red varieties were brilliant well into late fall on her windy balcony last year. I'm hoping I'll have the same success. Here are some of the pots I made up myself. I would like you all to think positive thoughts about Kevin watering them nicely next week when I'm in England. And as a note to everyone - if you're making up pots - better to make a couple well packed ones than lots of sparsely planted ones. If our summer is only going to start in June, we want to have as much colour as possible. Obviously this owner from the 'hood has instructed her gardener in the art of not wasting a bit of space. And back to my reality - the land of the plastic/fiberglass pot. I've collected all the pots and placed them close together to make things as easy as possible for Kevin. Wonder if there's a water-your-wife's-pot app for his phone? Not as many woody plants on display, but I managed to pick up three perennials. 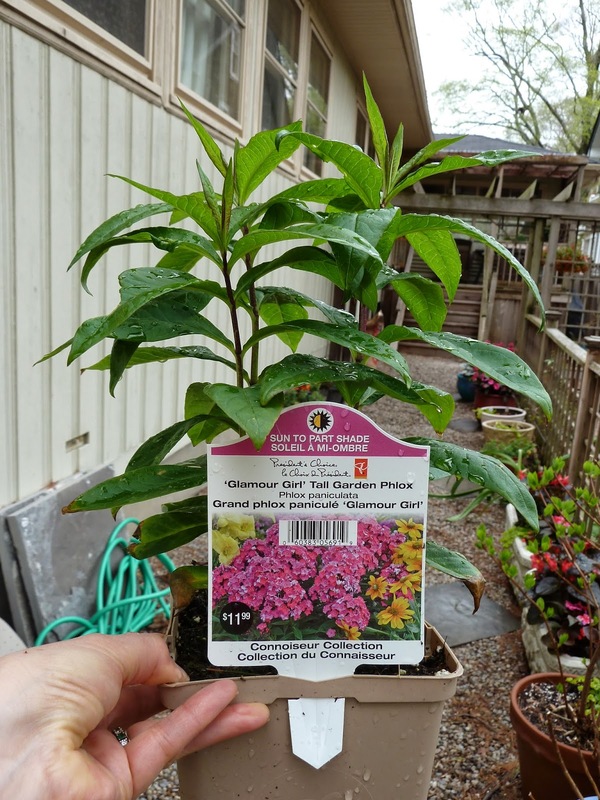 Loblaw is one of the few companies that sells perennials you can really collect - you put them in and years later they still come back - something I really appreciate after a winter like we've had where the death rate seems to have been somewhere around the 20% rate. This 'Glamour Girl' tall Phlox showed well in the trial gardens. 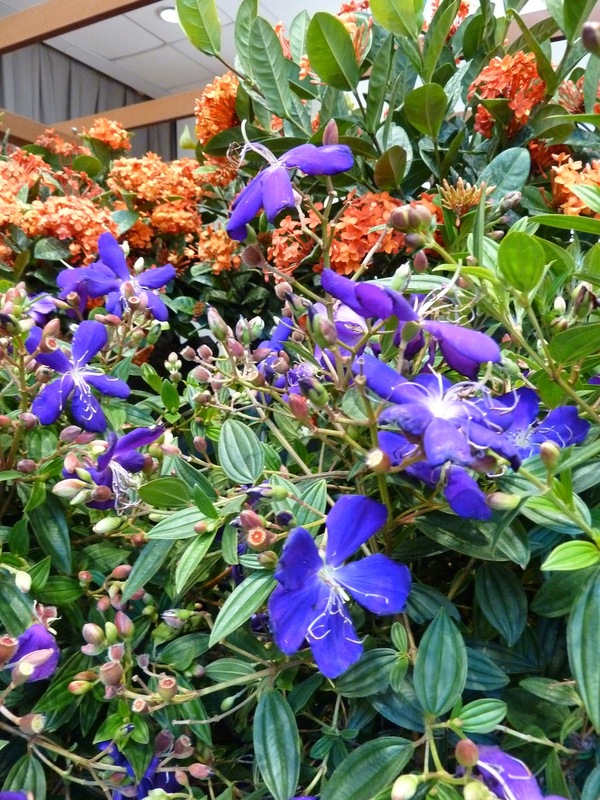 No mildew and great colour at a time when the rest of the garden can be quite boring. o.k. 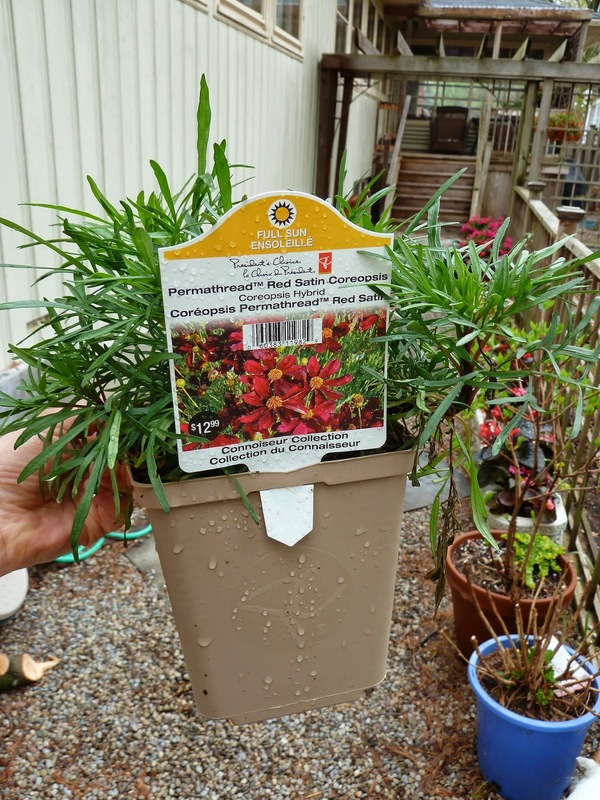 The grower said the difference between this little Coreopsis 'Permathread Red Satin' and all others is: "This one actually lives!" We shall see.... although, I've had excellent luck with 'Route 66'. 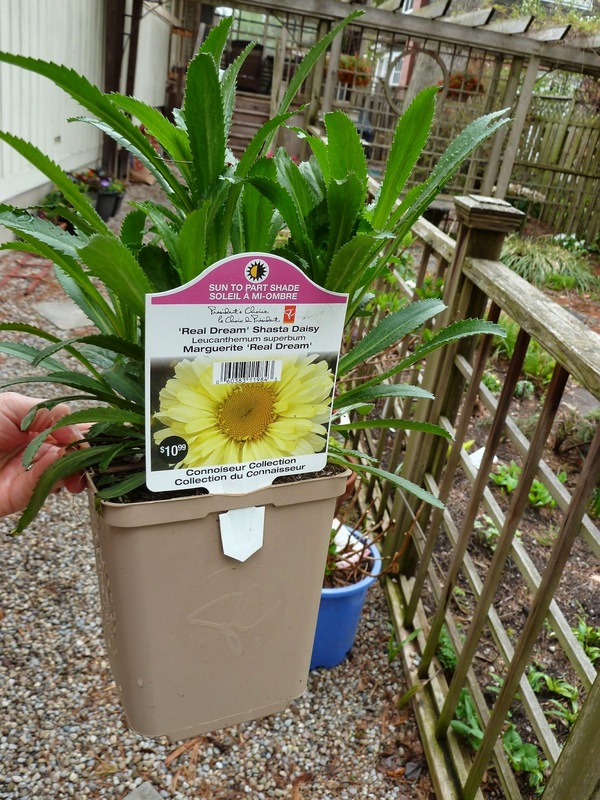 Smaller, sturdier, and with a soft yellow colour 'Real Dream' Leucanthemum. I'm a Rex begonia fan. 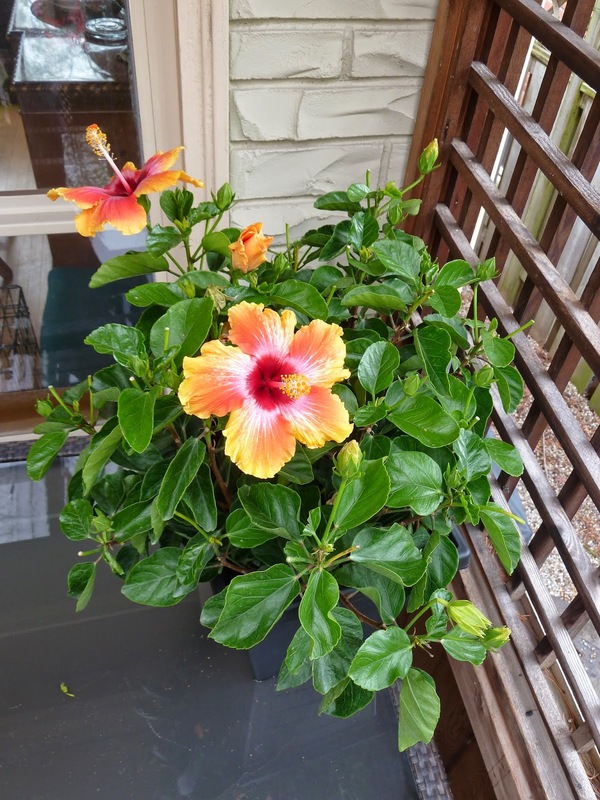 They are beautiful in pots and will take dark shade. Imagine how gorgeous this would be in a dark spot. 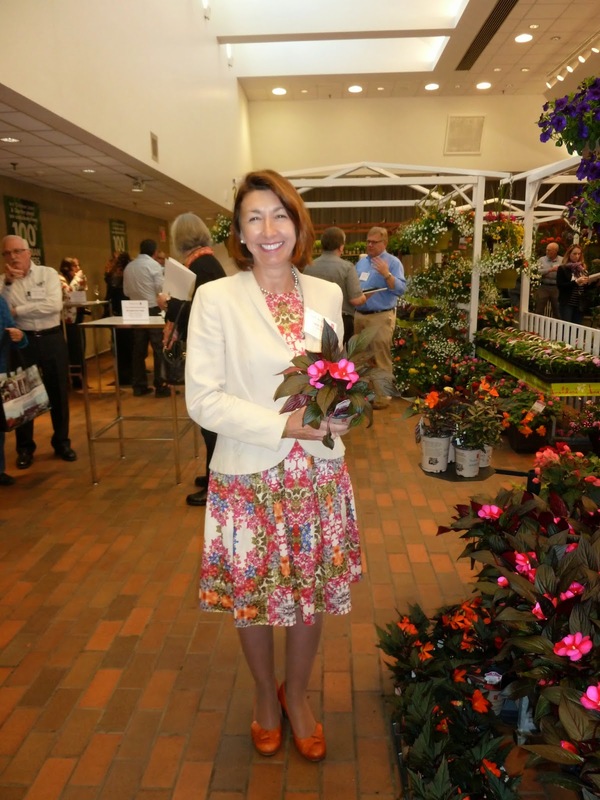 My annual blog star - the charming Diane Surette Cournoyer from Dummen - look at the size of the New Guinea Petticoat Blue Star Impatiens (note these impatiens DO NOT have the problem with mildew). And then, the bell was sounded and all those beautiful displays were pulled apart so we could take home a selection to try in our own gardens. The groupings represent individuals' hauls. We are very lucky indeed! I packed up my plants in the car; made room for myself; said goodbye to my buddies and thank you to Peter Cantley and his team who made this all possible. Stay tuned to learn about their progress throughout the summer. Barbara girl I am a fan of the Loblaw's garden centers myself and have collected a lot of perennials from them. Along with garden accessories like willow supports, pots at a great price .. and what can I say about end of season bargains but I jump ahead of myself here. Great little feature post girl! Great post as usual, gotta hit the Loblaws GC soon. Annuals look fabulous, too bad about not having more shrubs profiled. Wow, you had a harsh winter with a 20% die off. 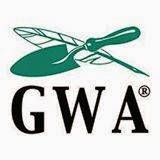 Good luck with the new perennials. 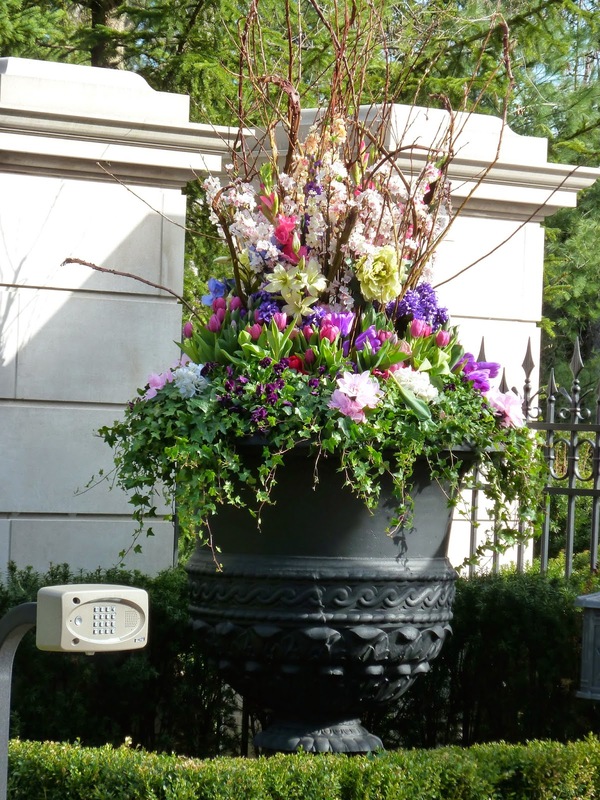 Your neighbour's back urn with the incredible number of plants looks great, but is there any room for soil in there? I really like that silver Rex begonia. Silver coloured plants are awesome for lighting up the shade. I like the subtleness of the Blue Jays petunia, with the white areas blending into the blue. It looks more natural. Good luck with all of your new plants. How fun. Looks like you came away with some dandy plants. I hope they survive and thrive.